Landstuhul is a small city located in the state of Rheinland-Pfalz of Germany. The city is known for US Army medical post known as Landstuhl Army Regional Medical Center. 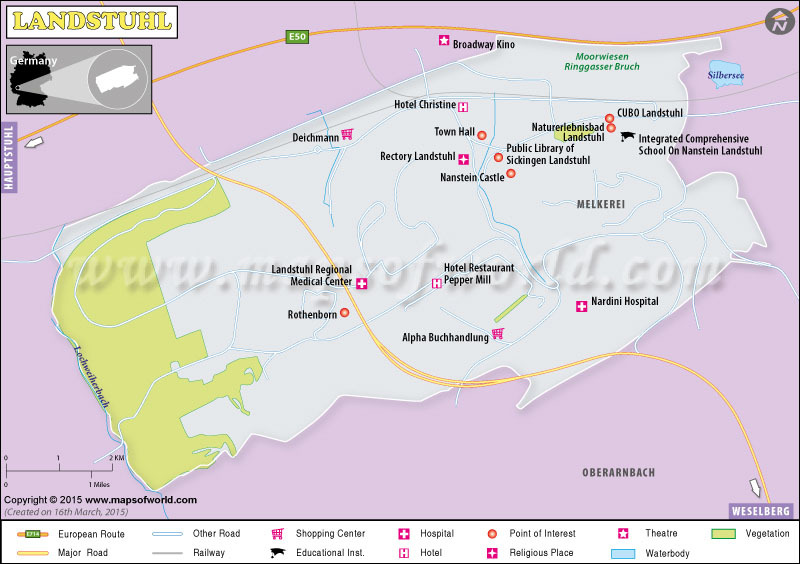 German (German: Deutschlandkarte) city Landstuhl is popular in America for the Landstuhl Regional Medical Center. For the American casualties Landstuhl is often the first stop before leaving for the continuing conflict in Afghanistan and Iraq. The Ramstein Air Force Base is also located near Landstuhl. Human settlement in Landstuhl can be traced back to 500BC in the Celtic period. Landstuhl was a holy place of the Romans for the "Heidenfels" or the heathen rock. The Burg Nanstein castle, built by the von Sickingen knight dynasty, is a notable landmark of Landstuhl. The locality of Landstuhl, Germany is the best place for day touring and excursions. The pleasing ambience offers many alternatives for mountain biking, motorcycle trip, bicycle tours, hiking or simply a tranquil walk through the woods.